This banh mi salad is a deconstructed version of the classic Vietnamese sandwich. It’s filled with greens, pan-fried lemongrass shrimp, pickled vegetables, jalapeño peppers, fresh herbs and croutons made of french baguette! Top it all off with a simple shallot vinaigrette. Thanks to Nature’s Intent Apple Cider Vinegar for sponsoring this post! When I was growing up in San Francisco, I went to Chinese school every Saturday morning. Yup, no Saturday cartoons for me! Just a few blocks away from the school was a popular Vietnamese café that sold banh mi sandwiches for $1.75. Chinese school was over at noon, which meant that the café would be crammed with hungry people. I was among that crowd. Their banh mi sandwiches were so tasty that I couldn’t help but squeeze my way up to the counter to order a BBQ pork one. fat: a generous amount of mayonnaise, pâté, etc. I thought it would be fun to adapt one of my favorite Vietnamese dishes into a salad! Here are some of the tweaks I made to transform the classic Vietnamese sandwich into a salad. Let’s start with the bread. Banh mi sandwiches are usually served inside a baguette-style bread. Here, I’ve turned the baguette into croutons. You can make croutons with a regular baguette or gluten-free bread. For the pickled vegetables, I used regular radishes instead of daikon radishes because they’re more readily available. I also soaked a few slices of jalapeño in the brine to give the vegetables spice. 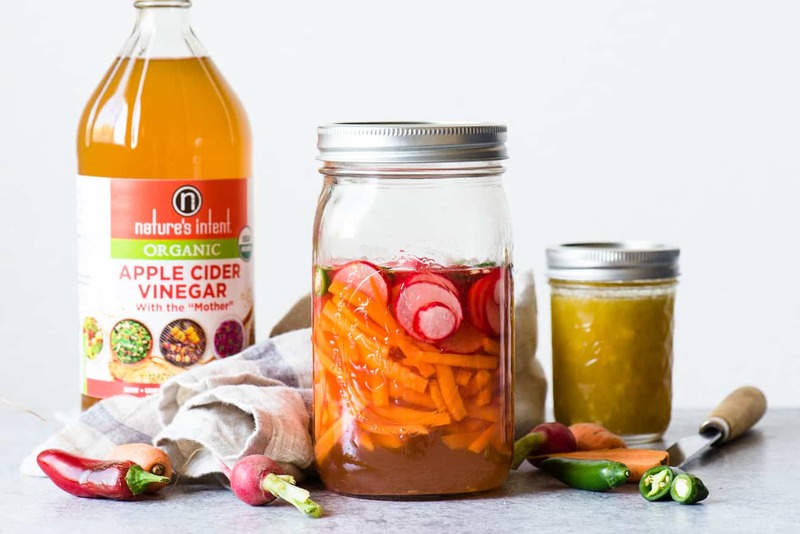 Usually, the pickling brine is made with distilled white vinegar or rice vinegar. I’m using Nature’s Intent Apple Cider Vinegar instead to give the vegetables subtle sweet flavor. It tastes great! 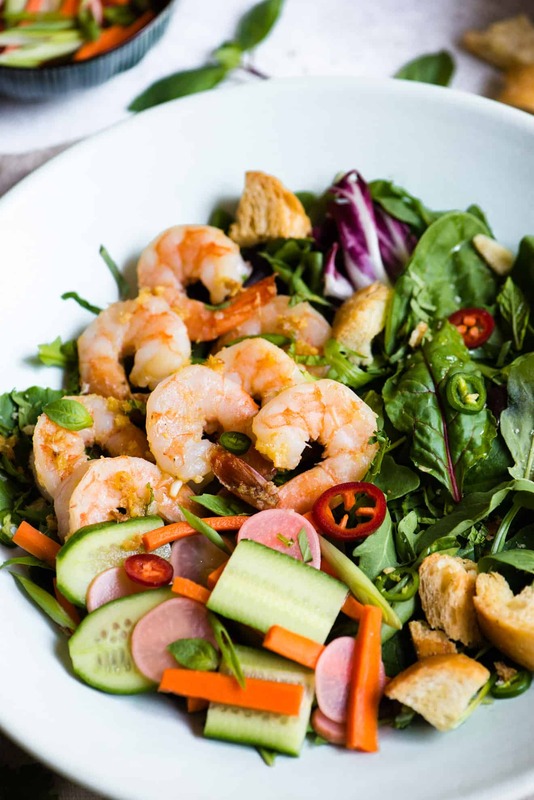 The main protein I’m using in this salad is pan-fried lemongrass shrimp. 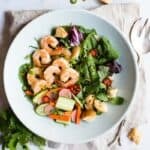 I happened to have an abundance of lemongrass and shrimp in my fridge when I developed the recipe, so into the salad they go! To round out the entire salad, I made a vinaigrette with shallots, apple cider vinegar and olive oil. I know there are a lot of components to this salad, but they complement each other so well! LOOKING FOR MORE FRESH SALADS? Prepare the pickled vegetables: In a medium bowl, mix the vinegar, water, sugar and salt until the sugar dissolves. Add the carrots, radishes and a few slices of jalapeño (if using) and toss to coat the vegetables with the pickling brine. Let the vegetables pickle for at least 30 minutes. Prepare the vinaigrette: Add all of the vinaigrette ingredients into a small jar. Shake the jar to incorporate all the ingredients. Set the vinaigrette aside to let the shallots marinade. The shallots will lose their raw bite the longer you let the vinaigrette sit. Make the croutons: Preheat the oven to 350ºF. Line a baking sheet with parchment paper or silicone mats. Cut the baguette slices into cubes. Toss with some olive oil and salt. Spread the bread onto the baking sheet and bake for 13 to 15 minutes, until browned. Let the croutons cool. Cook the shrimp: Heat a skillet or pan with 1/2 tablespoon of olive oil over medium-high heat. Add the garlic, ginger and lemongrass and cook until the spices turn fragrant, about 30 seconds to 1 minutes. Add the shrimp and 1 tablespoon of olive oil and cook for about 3 to 4 minutes before turning them over and cook for another 2 to 3 minutes. Sprinkle the salt on the shrimp and toss to combine. Turn off the heat and let the shrimp cool for about 5 minutes. 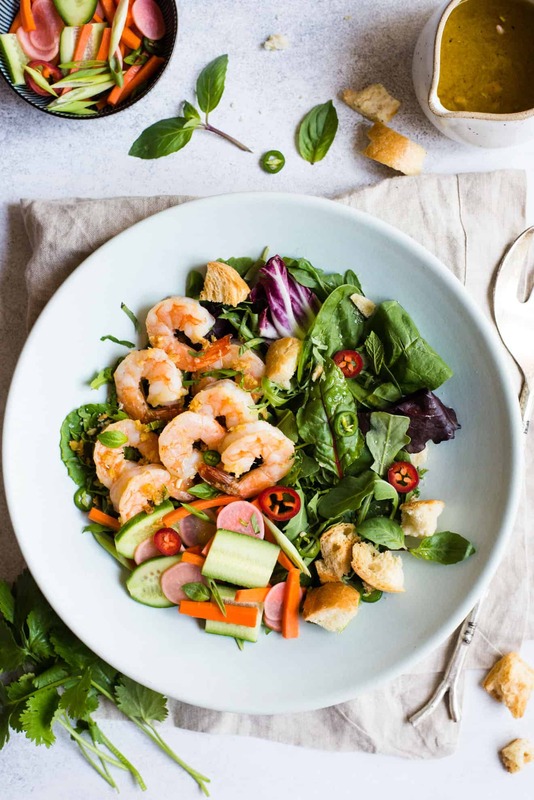 Toss the salad: In a large bowl, toss the salad greens, pickled vegetables, shrimp, herbs and croutons with a few tablespoons of vinaigrette. Taste and toss with more vinaigrette, if desired. You’ll probably have some vinaigrette left, which will keep in the refrigerator for 1 to 2 weeks. Serve immediately.